David Abrams, Ray Niaura, David Sweanor and I have submitted comments on the draft tobacco and vaping legislation under discussion in South Africa. South Africa is always influential in low and middle income countries, especially in Africas, and is always an important player in WHO meetings. The draft legislation is almost completely disproportionate in its approach to tobacco harm reduction technologies. It mostly treats reduced-risk products as though they are the same as smoking products. But minister tells Lok Sabha that e-cigarettes are harmful for both active and passive users. E-cigarette imports also doubled in the past two years. The government has said in the Lok Sabha there is no proposal to curb the import of e-cigarettes, a statement seen as a U-turn from its decision to ban the use of these devices across the country. The Eighth session of the Conference of the Parties (COP8) to the WHO Framework Convention on Tobacco Control (WHO FCTC) is less than three months away. Taking place in Geneva from 1 to 6 October, it will focus on topics such as the shaping of a medium-term strategic framework, which will determine the actions to be taken by the Parties over the next five years, and the advances and challenges revealed in the Global Progress Report on Implementation of the WHO Framework Convention on Tobacco Control. Many vapers see reducing the nicotine content of their liquids as being beneficial as a step towards quitting altogether or limiting harm. A new study points out that nicotine isn’t a problem, but increased toxin exposure is. The perspective is similar to a presentation given by Dr Farsalinos at the Global Forum for Nicotine in June. Anyone remember when the United States was all about the entrepreneur? How many sought their fortunes, the “American Dream” (including the white picket fence) and so forth? It seems that modern day America is now home to the corporations (very Continuum-like). So who better to look after the health and wellbeing of the population, than profit-driven mega-entities eh? You’ll remember that, around this time last year, the newly appointed FDA Commissioner Scott Gottlieb made an interesting, and somewhat controversial, announcement. Controversial for the likes of Campaign for Tobacco-Free Kids anyway. So controversial in fact, that they filed a lawsuit urging the FDA to apply the new rules. Last week, the U.S. Food & Drug Administration (FDA) released a draft guidance on the development of inhaled nicotine replacement therapies (NRTs) such as e-cigarettes, for harm reduction. A little over a year ago, Food and Drug Administration Commissioner Scott Gottlieb announced a fundamental shift in U.S. tobacco policy. While recognizing it’s the nicotine that hooks smokers, Gottlieb made clear what public health professionals have known for decades but have failed to communicate to the public. It’s the smoke, not the nicotine that leads to the deaths of more than 480,000 American smokers a year. For more than a year, the Food and Drug Administration has hung the start-up vapor industry out to dry with anticipation for a more sane and rational approach to the regulation of electronic cigarettes. Last week, the FDA finally announced steps geared towards making it easier to bring new products to market, soliciting input from the public and signaling that Obama-era prohibition may not be the intended outcome of the agency. This largely positive announcement takes a significant step in the right direction toward regulatory certainty that could unquestionably improve public health. The New Nicotine Alliance strongly condemns reported proposals to tax vaping products in the UK as a “retrograde step”. 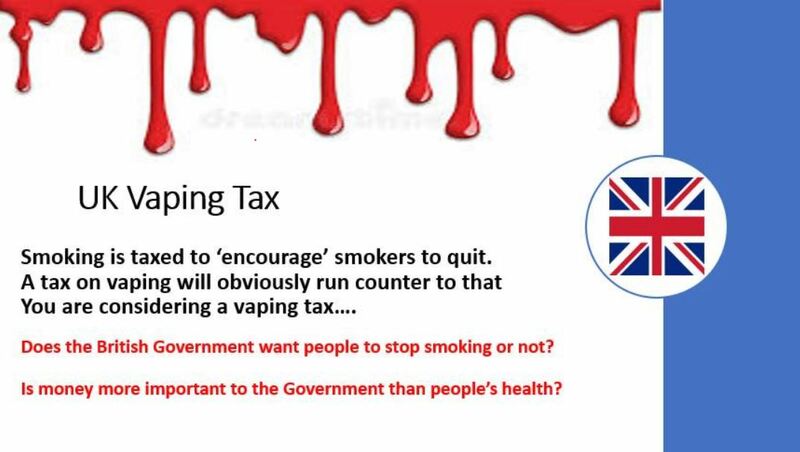 PHILIP Hammond must not slap a tax on vaping because it helps smokers quit, saves the NHS cash and would be counter-productive, campaigners insisted yesterday. In an open letter to the Chancellor and Health Secretary Matt Hancock, think tanks and pressure groups called on the Government to support an anti-smoking policy that “embraces harm reduction”. The UK Government’s Treasury Department has floated plans to impose a ‘sin tax’ on vaping, attacking harm reduction and punishing vapers for switching from smoking. Unsurprisingly, vapers, harm reduction advocates and independent commentators are less than impressed. The Conservative government are looking to vaping to help plug holes in its finances. 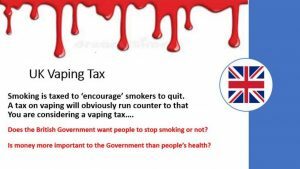 Ministers more concerned with revenue than the health of the voting public have spoken about implementing a ‘sin tax’ on vapers. As a non-smoker and a non-vaper, many people might wonder what my interest is in vaping. The answer is simple. I know from personal experience how beneficial vaping is for smokers who want to quit. My husband, a lifelong smoker, switched from smoking to vaping two years ago, mainly for his health. He hasn’t had a cigarette since. I have also heard many stories in my surgery about how constituents have successfully managed to quit their smoking habits for good through vaping. A tobacco industry-funded group wants to change the wording of a citizen’s ballot initiative that would significantly raise Montana’s tobacco taxes, a legal challenge that is part of the group’s expensive effort to defeat the measure when it goes to voters in November. Essex County could see a change in its tobacco sales policy before 2019. The Board of Supervisors held a public hearing Monday in regard to raising the legal age to buy tobacco products from 18 to 21. The board will choose whether to adopt the resolution at its regular meeting Sept. 4. The hearing falls in line with the goal of Tobacco 21, a national campaign focused on raising the age for purchase. The vaping market, which has created more than 4 000 jobs in the wholesale and retail sectors, is expected to generate an additional 10 000 jobs in South Africa over the next 10 years. This was according to Vaping Products Association of SA (VPASA) spokesperson, Fidel Hadebe, who said with a growth rate in value terms that was double that of formal tobacco-based products, the industry had positively towards the economy. An official said the decision to ban e-cigarettes with nicotine content in excess of 20 milligrams for every milliliter liquid was taken last Thursday without any notice to the public. It came after a hearing in July, in which Juul fought hard to prevent the ban. After Europe clocked off to go to the pub on Friday afternoon, America fizzled with excitement over the Food and Drug Administration’s (FDA) changed position on vaping. Although some commentators are suggesting there is still work to be done, many are welcoming it as saving much of the independent vape sector from almost certain death. This “much-needed move will save [the] vapour industry from decimation in 2018,” trumpeted the press release from the American Vape Association. 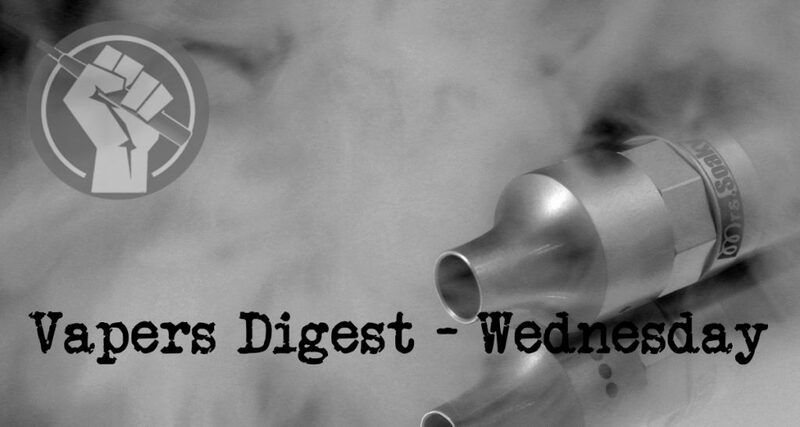 3 Pings/Trackbacks for "Vapers Digest August 8th"